With the flames still searing through flesh, and Jaime Lannister’s body vanishing from view, Game of Thrones fans flocked to watch the live stream of a for-Twitter recap show. Think any show Chris Hardwick does, only without Chris Hardwick. 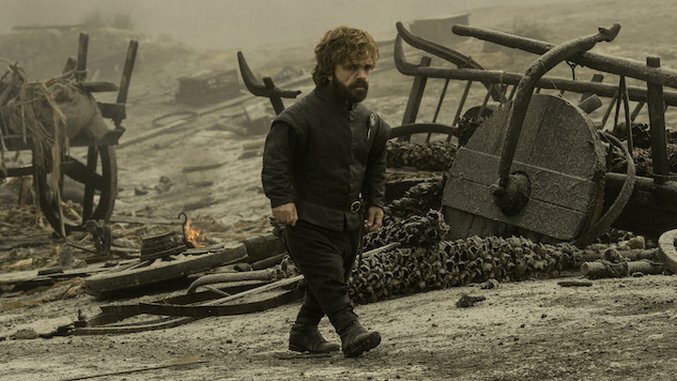 If Periscope numbers are to be believed, by the Monday afternoon following “The Spoils of War,” nearly 500,000 viewers had streamed Talk the Thrones, The Ringer’s post-show show. Superhero movies (and now some TV series) have the extended universe. Politics has 24-hour news. Sports has talking head shows and endless breakdowns in digital and on podcasts. In the age of peak TV, with the ascension of digital platforms as the preferred way for millions of people to experience just about anything, pop culture’s place in the proverbial conversation is changing: Its forms of fandom are starting to look a lot like sports’. Recaps have long been part of the way many consume television. Sites like Television Without Pity gave way to The A.V. Club and scores of other outlets that went deeper into the sub-cultures spawned by TV shows. But the ecosystem that now accompanies Game of Thrones—which consists not only of recaps and columns, but of entire websites, podcasts and talk shows devoted to dissecting every pixel of HBO’s blockbuster—is different, a form of full immersion the evolution of which mirrors sports media’s replacement of the game story with non-stop discussion and analysis. The breakdown of a football or basketball game—whether on Twitter, in a column, on a TV program, or on a podcast—now competes for attention with the actual plays in the game, and we now consume certain fictional TV series in much the same way, particularly when it comes to the kind of rich, enormous worlds created by Game of Thrones, Westworld and The Walking Dead. There’s a logic to this: A football game is too dense with strategy, player match-ups, mistakes, coaching calls, officiating and more to digest in full live. Fans don’t need but want to go deeper, to further their understanding of what they watched. Meticulous creators like Vince Gilligan (Breaking Bad), Sam Esmail (Mr. Robot), Noah Hawley (Fargo Legion), and David Benioff and D.B. Weiss (Thrones) likewise cram each frame with meaning. In order to unpack it all, fans turn to the media for the inside scoop, just as a sports fan flips on ESPN or heads to SI.com. This blurring of the line between sports and TV isn’t accidental: It’s no surprise that a site founded by a sportswriter, with a heavy focus on sports, should understand fanaticism. Indeed, since the sports model gave rise to the pop culture model, it follows that sports sites would be adept at capturing (and monetizing) that enthusiasm. Some TV fans have always been this engaged, this involved—the passion of the Television Without Pity and A.V. Club communities, or indeed the hand-wringing and theorizing over Lost, are proof enough of that—but for most people, TV fandom of this sort lacked an easy access point. Not everyone is going to Reddit to find fantasy show friends. Now, fans can use Twitter and Facebook to throw out ideas and theories, elevating the conversation from sub-Reddits (though they still take place there), as easily as fans can rip on their starting pitcher or general manager. And, increasingly, podcasts, Facebook Live videos and other forms of “post-game” TV analysis are available on mainstream outlets, not just message boards and in niche circles. One reason for this proliferation is clear, and it, too, comes from sports: An essential appeal of sports fandom is the collective experience of rooting for or against an outcome, and either celebrating or commiserating together. (Sports talk radio relies on this basic principle.) In the age of “peak TV,” it’s rare for a scripted TV series to create the same shared experience, and so fans crave—and want to extend—that experience through ancillary content—particularly critical considering how frequently audience “time-shift” their viewing. When Chris Hardwick hosts Talking [Insert Show Pun Here], then, fans come together to share and deepen their passion, and often receive additional insight and explication in the process. This second reason for the evolution of TV fandom, the desire to understand a TV series in a fuller way, is also reminiscent of sports. Even an NFL broadcast, when you break it down, is basically like watching a movie with the director commentary turned on: The broadcasters in the booth explain what you’re watching as it’s happening. Similarly—and for fans of Game of Thrones in particular—it’s become critical to consume supplements to our favorite shows: There’s simply too much going on, too many names to keep track of, too much dense source material for all but the most avid fan to hold in his or her head at once. Of course, film and TV have fueled fan cultures since their invention: From gossip columnists in the heyday of the studio system to podcasts like Nerdist or WTF, there’s no shortage of interviews with, analysis of, or speculation about the actors, directors and other creative minds who bring us the moving pictures we love. But Marc Maron isn’t breaking down Westworld’s multiple timelines, though I’m definitely here for that: There’s something qualitatively different about podcasts for diehards (Gilmore Guys, Kumail Nanjiani’s The X-Files Files, The West Wing Weekly), something closer in nature to the team-specific podcasts that have long existed in just about every major sport than to anything in the TV culture of past decades. As these examples suggest, Thrones may be ascendant—even The New York Times has a Game of Thrones newsletter, and sites across the web write quick-hit blog posts based on fan theories, Easter eggs, spoilers, trailers, clips and stills from the show—it’s not alone. It’s as important for fans of The Bachelor to listen to Here to Make Friends as it’s always been for Giants fans to listen to Mike Francesa, or for conservatives to listen to Rush Limbaugh—not just to be “in the know,” but to fully appreciate what’s happening in the “world” of The Bachelor. What are the fans saying? Who is the villain? Who became a meme on Twitter? When fans listen to a Bachelor or Bachelorette podcast, they’re entering the shared community of fans the same way fans of a fantasy epic (or an NHL franchise) might. It’s not, or not only, the content of the series itself that matters; it’s also the conversation about the content, which becomes a form of entertainment in its own right. Believe it or not, there are clear parallels between a discussion about which man is a best fit for the bachelorette and which free agent could best help an NBA team—and, as the NBA proved earlier this summer, it’s one the best soap operas on television… and the Internet, and Twitter. People love it for all the same reasons they love actual soap operas. While it’s true we’ve moved away from enormous shared cultural experiences, the Internet has allowed us to find more types of shared experiences with hyper-specific groups. There are communities for what feels like literally everything. That we now have dozens of platforms where content is being created may lead to the segmentation of the viewing public, but that doesn’t dampen the enthusiasm with which that content is consumed. And as momentum builds, the fear of missing out drives even more attention and enthusiasm from viewers. Thrones was already one of the biggest shows on television, but the conversation it’s driven online and in the media this season has further boosted ratings. We’ve seen a similar evolution in sports. A Steph Curry three-point barrage or a Jordan Spieth birdie run can send people to tune into a live event thanks to reading about it on social media. The same thing now happens in pop culture, only it’s less about something literally happening right that moment and more about a TV series, or even podcast (Serial, for example) that you need to be following. Fans wanted more Thrones, so they got it. It’s the same principle that brought us ESPN, the Internet sports revolution, and now companies like Facebook and Twitter investing in live sports rights. We’ve always been a culture obsessed with sports and television. The model of sports fanaticism laid the groundwork for the mainstreaming of television fanaticism. It may have taken a hegemonic show like Game of Thrones for us to reach sports saturation levels, but we’re here now, and the insatiable appetite for content has already expanded well beyond HBO’s signature series. If anything, the proliferation of content across so many platforms only opens up the potential for more and more shows that catch people’s attention and spur their passions. Winter isn’t coming any time soon. Peter is a sports journalist whose writing has appeared in Sports Illustrated, SB Nation, Paste, FanRag Sports, Bleacher Report, Fox Sports, and GOLF.com, among other publications. He lives in New York, hates your favorite team and tweets bad jokes @peter_bukowski.